Product Research: New Generation Supplements utilizes extensive university research to develop and continually improve SmartLic Supplements. This research has helped produce scientifically advanced, nutrient dense livestock supplements. Producers see the results of this research in greater animal efficiency and performance. Product Quality: New Generation Supplements is also dedicated to product-manufacturing research and testing new technologies that help minimize manufacturing costs and ultimately improve product quality and value. SmartLic supplements are made through a continuous flow process protected by two separate patents. The result is a harder, more consistent, nutrient dense product that makes consumption predictable and helps minimize supplemental feed costs. This technology also makes SmartLic supplements highly resistant to inclement weather, allowing it to be fed successfully year round. SmartLic Supplements are Nutritionally Engineered® to provide essential nutrients that help support optimum forage utilization and reproductive performance. In addition, SmartLic Supplements are designed and produced with the latest technology so consumption rates are controlled. Forage quality and availability drive intake levels. Product consumption increases when lower quality forages are fed and decreases when higher quality forages are fed. Typical product intake is 3/4-pound per head per day. Protein levels are extremely important. Therefore, several products with varying protein levels are available to complement different quality forages. Calcium and phosphorous are important minerals in forage fed diets. Magnesium is essential for neural activity, muscular reflex, digestion of fats, digestion of proteins and energy utilization. All NE SmartLic supplements are fortified with a minimum of 2% phosphorous and provide proper levels of calcium. 2% magnesium is provided in NE Mag supplements. 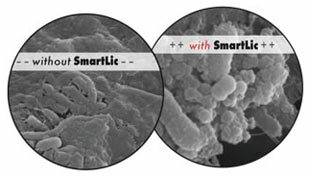 SmartLic NE Supplements eliminate the expense of free-choice minerals. 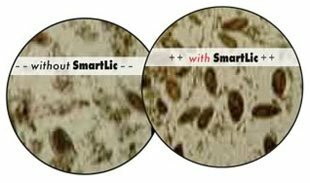 Based on a 1,200 lb cow consuming ¾ lb/head per day, all NE SmartLic Supplements provide 125% of the recommended NRC levels of trace minerals. This ensures proper nutrient intake and eliminates the need of additional mineral supplementation. Vitamins are vital. Adequate quantities of vitamins are needed to help cattle efficiently utilize other nutrients. All SmartLic Supplements are fortified with fat-soluble vitamins A, D and E.
SmartLic Supplements are formulated with high quality ingredients, resulting in a high energy supplement. SmartLic® research has demonstrated that supplementation with SmartLic blocks can effectively improve forage intake and cattle performance. Supplementing with SmartLic supplements provides essential nutrients that can improve utilization of low quality forages. The predictable, economic intake of SmartLic supplements is small in comparison to the benefits realized by livestock. 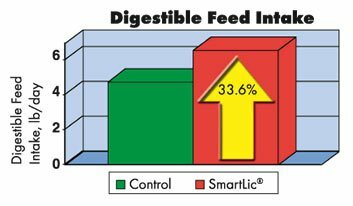 Research has shown at least a 30% or higher improvement in digestible feed intake. Learn more about Forage Utilization. University research shows SmartLic supplements increase protozoa counts by more than 19,000 protozoa per gram of rumen fluid, resulting in a significant improvement in forage utilization! University research has documented the effects of SmartLic supplementation on populations of bacteria, ultimately increasing both the number of bacteria and their digestive activity. These images were taken using a scanning electron microscope at 10,000-fold magnification. SmartLic NE-22 IGR, NE-Mag 22 IGR, NE-30 IGR and MinLic IGR supplements fortified with Altosid®, offer the most effective and convenient way to control horn flies in beef and dairy cattle. Altosid helps reduce horn fly populations by breaking the life cycle of the fly, preventing the development of biting adult flies. By providing IGR fortified SmartLic supplements producers can effectively stop the cycle of horn flies and help improve the performance of their cattle. Learn more about Fly Control. Metal amino acid complexed minerals are absorbed more readily than inorganic trace minerals. Complexes are formed when trace minerals such as zinc, manganese and copper are bonded to an amino acid. These amino acids serve to transport the minerals across the intestinal wall resulting in increased absorption. Trace mineral uptake is vital to maintain and improve adequate trace mineral status and thus improve subsequent immune response and animal performance. Trace mineral status affects overall herd reproduction and health. Cows consuming a balanced ration that includes highly bio-available trace minerals are more likely to produce healthy calves that perform well at weaning. Animals most likely to benefit from complexed trace minerals include cattle experiencing stress such as weaning, shipping, adverse weather conditions, or dairy cattle in high production. As trace mineral status declines from adequate to deficient; enzyme function, immunity and production declines. The following benefits are evident as trace mineral status improves in cattle. Reproduction: Improved conception rate, improved heat detection, fewer embryonic deaths, shorter calving intervals, vigorous calves. Reduced Stress: Proper trace mineral supplementation dramatically reduces the negative effects of environmental stress, stress associated with high production, shipping and weaning stress and disease resulting in health and animal performance. Vitamin Stability: Inorganic trace minerals are ionic salts with multiple charges. Charged metal ions oxidize vitamins, resulting in a reduction in vitamin activity. Complex trace minerals form metal amino acid compounds with a neutral charge. This electrically neutral compound minimizes loss of vitamin activity. New Generation Supplements and the SmartLic Class of Supplements were created out of the need for better, higher quality feed supplements; supplements that would not only provide the highest nutritional value, but would also help producers minimize their supplemental feed costs. With this goal in mind, some of the feed industry’s pioneers joined together to attempt to make their dream come true. Years of experience and commitment to quality have taken New Generation Supplements from fledgling company to a powerhouse in the feed industry, with a major network of feed supplement dealers and thousands of satisfied customers. Today, SmartLic Supplements are recognized across the United States and Canada as the most nutrient dense, highest quality cattle supplements available. SmartLic®, StressLic®, FlaxLic®, DryLic®, and Nutritionally Engineered® are registered trademarks of New Generation Supplements. MinLic® and MagLic® are also registered trademarks of New Generation Supplements.